Then Cirion went up the stair with Eorl and the others followed; and when they came to the summit they saw there a wide oval place of level turf, unfenced, but at its eastern end there stood a low mound on which grew the white flowers of alfirin, 1 and the westering sun touched them with gold. Tuor saw beside the way a sward of grass, where like stars bloomed the white flowers of uilos, 2 the Evermind that knows no season and withers not; and thus in wonder and lightening of heart he was brought to the Gate of Silver. 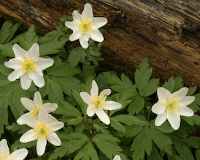 Wood anemones, Anemone nemerosa: Tolkien said that the flowers of alfirin (also known as uilos or simbelmynë) resemble these. Upon their western sides the grass was white as with a drifted snow: small flowers sprang there like countless stars amid the turf. Helm was brought from the Hornburg and laid in the ninth mound. Ever after the white simbelmynë grew there most thickly, so that the mound seemed to be snow-clad. 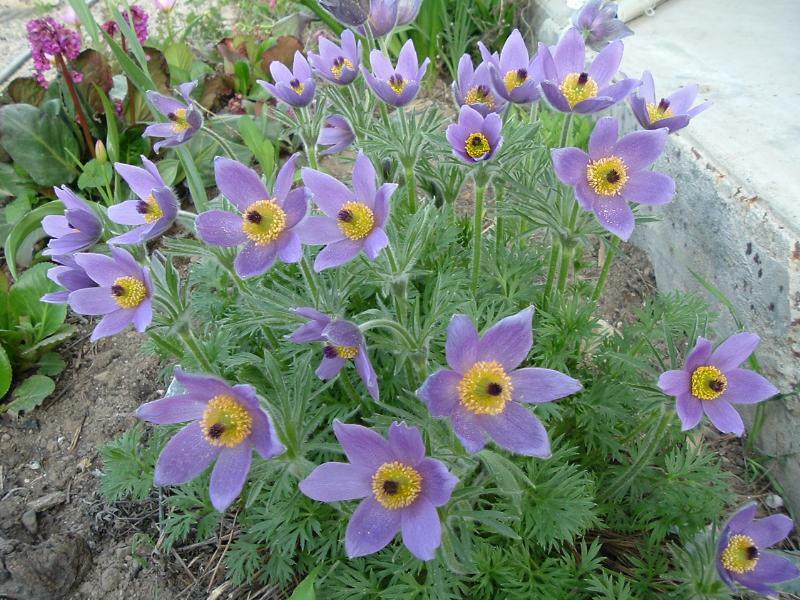 Pasque flowers, Anemone pulsatilla: Tolkien said that the growth habit of alfirin is similar to these. Evermind. A flower-name, translation of Rohan simbelmynë. 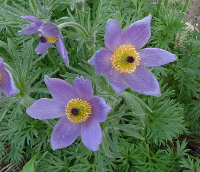 The element -mind has the sense 'memory'; the name thus resembles 'forget-me-not', but a quite different kind of flower is intended: an imagined variety of anemone, growing in turf like Anemone pulsatilla, the pasque-flower, but smaller and white like the wood anemone. Translate by sense. The Swedish and Dutch versions both omit the element -mind, and so produce names equivalent to 'everlasting flower', which is not the point. Though the plant bloomed at all seasons, its flowers were not 'immortelles'. (The Swedish has evighetsblommor, the Dutch Immerdaar). I have greatly enjoyed the Cape Flower Book. 3 Quite fascinating in itself and in its general botanical and indeed paleo-implications. I have not seen anything that immediately recalls niphredil or elanor or alfirin; but that I think is because those imagined flowers are lit by a light that would not be seen ever in a growing plant and cannot be recaptured by paint. Lit by that light, niphredil would be simply a delicate kin of a snowdrop; and elanor a pimpernel.... Alfirin ('immortal') would be an immortelle, 4 but not dry and papery: simply a beautiful bell-like flower, running through many colours, but soft and gentle. PHIR- Q firin dead (by natural cause), fírima mortal; fire mortal man (firi); firya, human; Firyanor = Hildórien; ilfirin (for *ilpirin) immortal; faire natural death (as act). N feir, pl. fîr mortals; firen human; fern, pl. firn dead (of mortals). Dor firn i guinar Land of the Dead that Live [KUY]. Firiel = ‘mortal maid’, later name of Lúthien. 1 alfirin: the simbelmynë of the Kings' mounds below Edoras, and the uilos that Tuor saw in the great ravine of Gondolin in the Elder Days.... Alfirin is named, but apparently of a different flower, in a verse that Legolas sang in Minas Tirith (The Return of the King V 9): "The golden bells are shaken of mallos and alfirin / In the green fields of Lebennin." Strawflower Helichrysum orientale: an example of the immortelles mentioned by Tolkien. Their flowers resemble daisies. They are much in demand as dried cut flowers. They come in an array of almost all colors, except blue. "Strawflower". Wikipedia, the free encyclopedia. (9 Dec. 2007).